Funnily enough this was the most popular of the tours for those wanting to book on with me. In total there were 10 of us that headed out of town and into the scenic Yarra Valley for a spot of wine tasting for the day. We had 3 Australians on the bus as well who were quite quiet initially but warmed up throughout the day as the tasting went on! 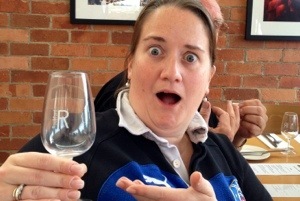 It did feel somewhat wrong to be starting a wine tasting tour at ten in the morning?! 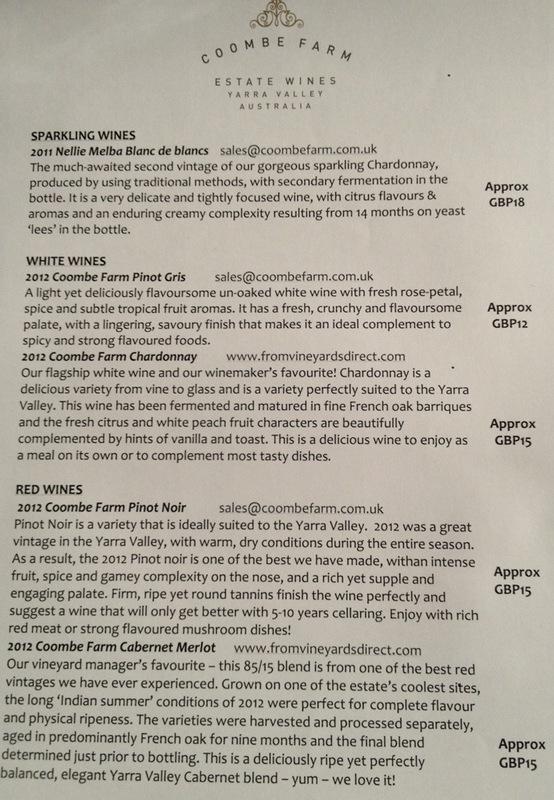 We tasted 12 different wines, but I was a little bemused that we weren’t shown how to taste the full flavour and so on. We were just given a bit in the bottom of the glass told what the grape was each time & carried on. I think at the first vineyard, Oakridge, we tasted a total of 12 different wines – 6 white & 6 red. I tasted them all, of course, but was not drinking all of the tasters of the reds. Loosened up on we pressed to the delicious cheese shop from the dairy farm in the valley, little samples of goats cheese which, were I staying longer, I’d have purchased the full piece of. It was simply delicious, so creamy and fresh tasting. 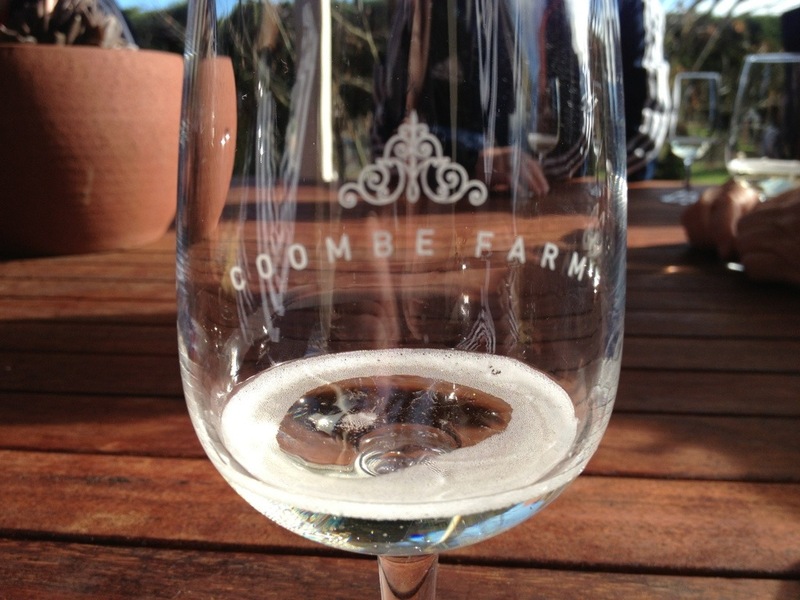 Our second vineyard of the day was Coombe Farm where again we tasted around five or six of the red as well as the whites. The lady telling us the details of all of the wines was a wonderful character and full of great humour. I clicked part way through that Lord Vesty is one of the other syndicate members in a couple of the horses that Dad has had an interest in over recent years. His daughter as well, of course I was at junior school with – Flora, but hardly remember her to be honest. Small world and all that! She reminded us of all the horrendous bush fires of 2009 and showed us where the fires came up to on their property, many of the vineyards in the surrounding area were badly damaged but thankfully the wind changed JUST as the fires had come up to the edge of the property the winds changed and blew it in a totally different direction. 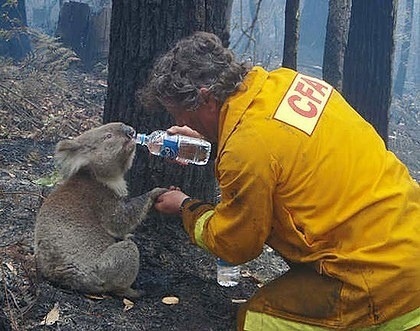 It was not far from here that the picture of the fireman giving the koala some water was taken. We headed on to where we were going to be dining (the Rochford Winery). No buffet here, instead we were treated to a delicious choice of main meals of which I chose a slow cooked beef off the choices. First though we had another wine tasting session. This would have, in my view, been far better placed AFTER we had eaten as we were all feeling rather topped up on the old vino already! Kay & I for one were incredibly giggly at nothing much in particular & she couldn’t stop at one point! The lady giving us the wine tasting session was teaching us the way of doing it and helping us through the whole process a lot more than previous vineyards. Smelling it, swirling it, swooshing it spitting it which as I am sure you can possibly gather had us in stitches even more! Our last stop was the Australian version of Moët & Chandon (the name escapes me at present & my guide book is not currently to hand) After a full glass of wine at lunchtime I was feeling pretty full of wine and so decided to be sensible and not actually taste all of the different ones here and only tried the first sparkling before passing quietly and nipping outside to soak up the sunshine and the views. On the way home we stopped in on a chocolate shop and partook in a few samples, but managed to refrain from buying any to take home! The views were still stunning of all the vineyards out in rows, ok wrong time if year to see them growing but you could imagine the scene in summer time and how very different but yet even more beautiful the scenery would be. Posted on June 28, 2013, in Lions 2013 and tagged British & Irish Lions, Coombe Manor, giggles, Melbourne, Rugby Union, yarra valley. Bookmark the permalink. Leave a comment.